Local business couple, Di and Peter Kingham, have been an integral part of the local business community since they first launched their business, Magnolias, in Edenbridge over five years ago. Since then they have both become familiar faces around town, not just from having a shop but through the local activities they have become involved in. Di can regularly be found in fancy dress on stage at the WI Hall where she performs with popular local amateur dramatics group The Forge Singers. Peter on the other hand has been featured frequently in the local newspapers in his capacity as Chairman of the Eden Valley Chamber of Commerce. Many readers will remember the treasure trove of gifts, toys, furniture, ornaments and furnishings that would fill their old shop in Edenbridge High Street, and it certainly has been missed since closing earlier in the year. 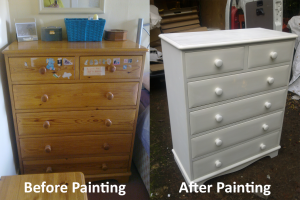 The change has been a positive one though for Di and Peter, especially due to the increase in demand for the handmade curtains, blinds and upholstery it has meant they can now focus on delivering these services without having the additional work involved of running a shop. With the same extensive range of fabrics to choose from, appointments are now made in your home and Di will turn up with her swatch books, tape measure and will be able to help you choose the most suitable fabric for your requirements. 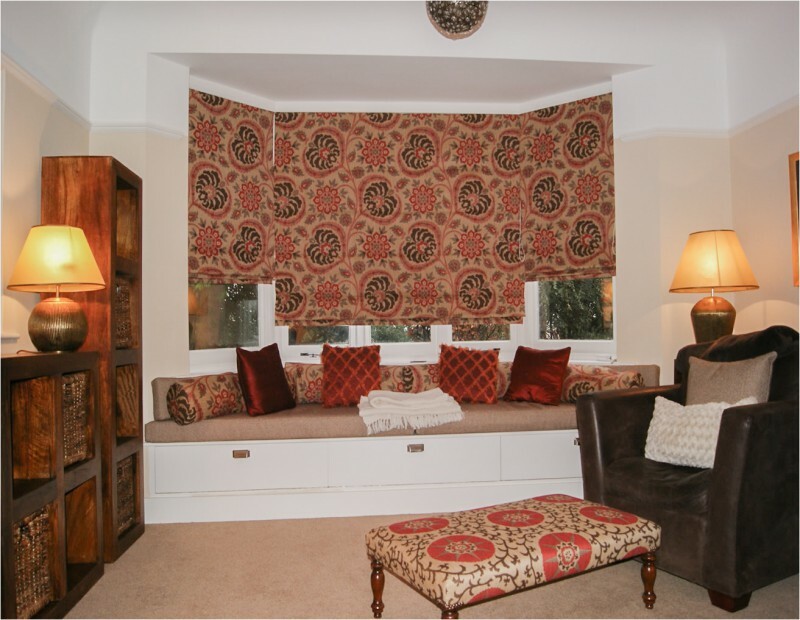 Whether you’re after a new set of curtains for the lounge, chair covers for your dining room or a new blind for your bathroom, Di is able to turn up with a wide selection to choose from. 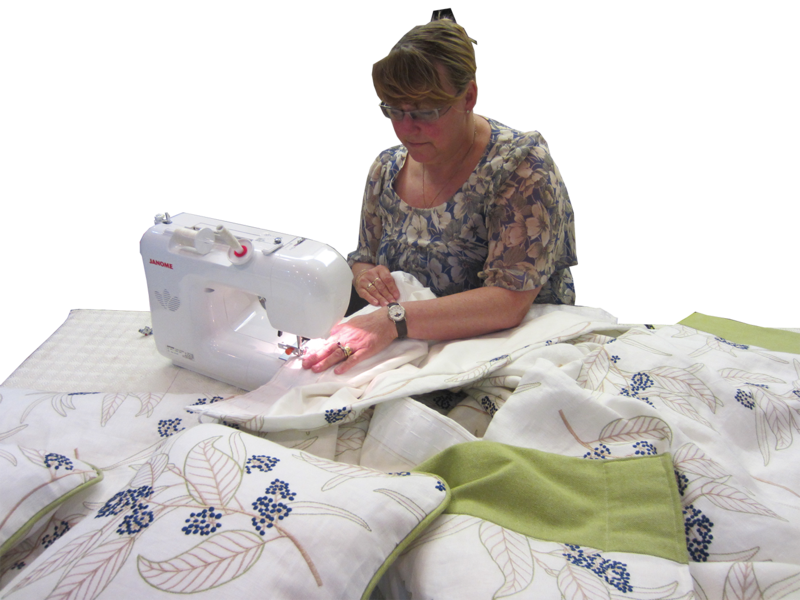 She can also work with fabric you provide if it is suitable. Of course one of the big advantages of having your furnishings handmade is that you can really coordinate your home’s interior. It’s not just the huge selection of fabrics Di has access to but you can also select the most complimentary curtain poles or tracks for your window space at the same time. Part of the service also covers the fitting and hanging of your window dressing and this will all be detailed in your quote. 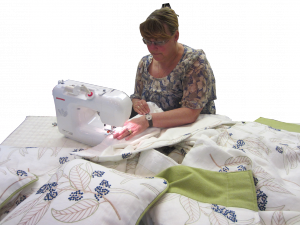 Now that your windows look great, you might want to have chair covers or cushions to match, something which of course Di can make for you as she is a whizz on the sewing machine and can create just about anything. Magnolias at home also provide a furniture painting service so you can match your current furniture to fit in with your new fabrics. There is a free collection and delivery service (within a set distance) so you don’t have to worry about transport of these items yourself. One of the regular activities which Di started at the shop was the ‘Knatty Knitters’ group – enthusiasts who would knit (or crochet) while enjoying tea and biscuits together, sharing tips and providing help and advice to one another. Di has continued the group who now meet on Wednesday mornings at the BRIDGES Centre in the High Street. At BRIDGES you’ll also find a haberdashery cabinet so you can still purchase wool, cotton and other items locally for your projects. If you would like to make an appointment with Di or find out more about the services on offer, call 01732 866 444.